Audio-Technica unveils new range of headphones at CES 2018 | What Hi-Fi? The five-strong range (including the ATH-DSR5BTs shown above) is due to hit UK stores in the spring. CES 2018 is well under way, and Audio-Technica is using Las Vegas to display a smörgåsbord of headphones for the new year. The wireless, noise-cancelling, and neck-bud varieties are all covered. Let's start with the most expensive. The ATH-DSR5BTs are a pair of neck-bud headphones with aptX HD Bluetooth (for 24bit/48kHz file compatibility). Audio-Technica says the two 9.8mm and 8.8mm drivers in the headphones - each moving in opposing directions and wired out of phase - give an improved sense of timing and can better reduce distortion. 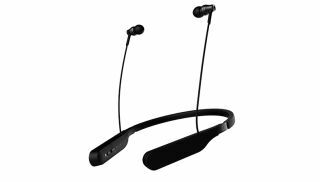 It also says that, because the headphones have been designed to keep the audio signal completely digital from source to drivers, they provide "a level of detail and clarity never heard before over a wireless connection." A lofty claim by anyone's standards - so it'll be interesting to see if this £350 design can make good on it. For those who prefer something bigger, and like to block out the irritations of the outside world, there are the ATH-ANC700BTs. These wireless, aptX Bluetooth-toting headphones provide 'CD-like' quality through their 40mm drivers. They also have noise-cancellation built in, with a battery that will last a claimed 25 hours with noise-cancelling on (and 30 with it off). Playback is managed via touch controls on the headphones' housings, a feature that we've seen on more expensive headphones like Sony's WH-1000XM2. Prices for the ATH-ANC700BT start at £200. Runners (and other sportspeople) looking to sweat away the pounds piled on by Christmas dinners might have their heads turned by the ATH-SPORT70BT or ATH-SPORT50BT. Both models hold an IPX5 certified rating, meaning they're unfazed by rain or sweat, and both feature the same 9mm drivers, the same six-hour battery life and Bluetooth 4.1 connectivity. What sets them apart is the switchable ambient noise filter - activated by touch control - on the 70BT, which the 50BT lacks. The ATH-SPORT70BT come in at £120, while the ATH-SPORT50BT are £70. Finally, Audio-Technica also has some rather more conventional over-ear wireless headphones, the ATH-S200BTs. These have a 40-hour battery life (with full charge apparently achievable in four hours) and Bluetooth connectivity, and weigh in at 190g. As with the other new headphones, the ATH-S200BTs will be available in early 2018 - they'll be priced at £59.